The National Football League has already lost their war against The America People. They thought their war was against President Trump. No, it was against The American People who love their country, respect their Flag, and their National Anthem. The NFL lost. The NFL’s disrespect for patriotism has unified the Country against them. I’m sure after seeing the reaction of The American People, and loss of revenues, the NFL will find a way to stop their disrespect. So, when at the Alabama rally last Friday, President Trump called out the millionaire football players for taking a knee during our National Anthem and disrespecting our Flag and nation, he was voicing the sentiments of The American People. He was hardly breaking new ground. Granted, the U. S. Constitution protects the NFL players’ right to foolishly demean our Nation and Flag. However, they should consider this: throughout our Nation’s history, men and women; white, black, brown and yellow, have fought and died under our Flag, and many have been buried under that Flag. By taking a knee during the National Anthem, these players demean their sacrifices. Right now, these men and women of all races are still fighting and placing themselves in harm’s way for that Flag and the football players right to take a knee. Unlike these players, however, they don’t get millions for doing so. A poignant moment in last Sunday’s Pittsburgh-Chicago game came when Pittsburgh Steelers star, Alejandro Villanueva, refused to go along with his teammates who were cowering in the locker-room during the National Anthem. He stepped alone onto the field and paid respect to the Country he had fought for. Villanueva is a West Point graduate and former Army Range officer who served three tours of duty in Afghanistan. He received a Bronze Star for valor. 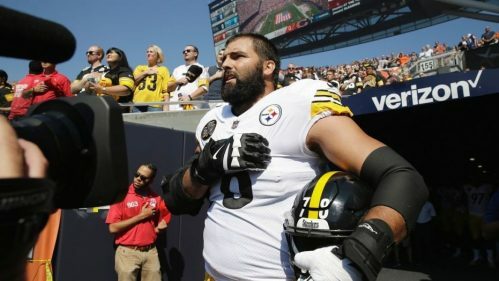 In response to Villanueva’s exercise of his free speech, Steelers coach Mike Tomlin scolded Villanueva while praising his players cowering in the locker room. Their ridiculous excuse for not coming onto the field was that they did not want to get involved in politics. Not coming on the field during the National Anthem, was a political message. They are now suffering the consequences of that message, as Steeler fans, some of the most ardent fans in the world, are burning their Steeler paraphernalia. In concern for the right of free speech, which the President and all Americans support, and amnesia about Colin Kaepernick’s sideline antics, the NFL officials and players incoherently and dishonestly claimed it was the President who caused disunity. The NFL players don’t seem to realize that there are ideals bigger than a game, bigger than money, and bigger than themselves. Those ideals are demonstrated by our Armed Forces in harm’s way who are putting their lives on the line so that these millionaire athletes and billionaire owners can peacefully enjoy their wealth. Every one of these heroes understood the beauty of the United States and her ideals. These men have included NFL greats of the past who gave “the last full measure” of their lives for the Country: Pat Tillman, Robert Kalsu, Jack Lummus, and Don Steinbrunner. I know there are still patriotic, God-fearing men in professional football today. Most Americans have heard the story of Pat Tillman, the stand-out NFL safety who turned down a contract offer of $3.6 million and opted instead to join the United States Army in the aftermath of 9/11. 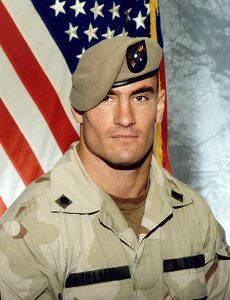 Tillman, an Army Ranger, was later killed in Afghanistan. Fewer people have heard of Jack Lummus, who cut short his promising career with the New York Giants to join the Marine Corps after the Pearl Harbor attacks. Lummus received the Medal of Honor after knocking out three enemy strongholds on Iwo Jima after being hit by a hand grenade. Just before his death, he continued to urge his platoon on in the attack even after losing both legs to a landmine. Robert Kalsu and Don Steinbrunner played for the Buffalo Bills and the Cleveland Browns respectively. These men lost their lives serving our Country in Vietnam. Each year we watch the NFL embarrassingly apologize as its 300 pound “men without chests” are caught again-and-again physically abusing their 110 pound wives and girlfriends. The NFL ignores honor, decency, respect for our country and is surprised when their players are found to be without honor, without decency, and without respect for their fellow men and women.